Aim: The aim of this study was to study somatosensory amplification, health anxiety (hypochondriasis), and alexithymia among patients with generalized anxiety disorder (GAD) and to evaluate the association of these variables with the severity of GAD. Materials and Methods: Cross-sectional design was employed, and patients were recruited from the outpatient clinic of the psychiatry department of a multispecialty tertiary care medical institute in North India. The patients who were clinically diagnosed to have GAD by the two independent qualified psychiatrists were screened with Mini International Neuropsychiatry Interview to confirm the diagnosis. 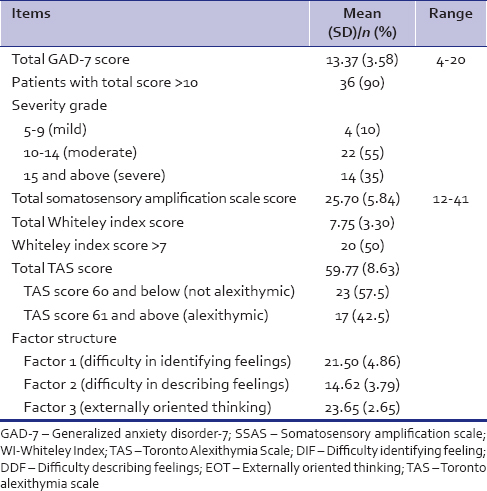 Forty patients with GAD meeting the inclusion criteria were assessed with GAD-7 scale, somatosensory amplification scale (SSAS), the Whiteley Index (WI) and Toronto alexithymia scale - 20 Hindi version (TAS-H-20). Results: The mean scores of patients with GAD on SSAS, WI, TAS-H-20, and GAD-7 scale were 25.70 (SD-5.84), 7.75 (SD-3.30), 59.77 (SD- 8.63), and 13.37 (SD- 3.58), respectively. Half of the patients with GAD had significant health anxiety as defined by WI score of >7. Around 40% of GAD patients were alexithymic as defined with TAS-H-20 scores of >60. SSAS, WI, TAS-H-20 had a positive correlation with the severity of GAD as measured with GAD-7 scale. Conclusions: GAD patients have significant somatosensory amplification, health anxiety (hypochondriasis), and alexithymia. Accordingly, there is a need to develop effective psychological interventions focused on these factors in GAD. Generalized anxiety disorder (GAD) is a chronic, relapsing anxiety disorder characterized by symptom clusters of worry, functional somatic symptoms, and autonomic hyperactivity. International Classification of Diseases 10 (ICD-10) diagnostic criteria still includes symptoms from all the above-mentioned psychopathology clusters of GAD. However, in the diagnostic and statistical manual of mental disorders (DSM), the redefinition of GAD in successive editions appear to shift in focus away from somatic to psychic concern in the diagnosis of GAD.,,, However, the presence of functional somatic symptoms is must for the diagnosis of GAD both in DSM 5 and ICD-10. In the primary care settings, functional somatic symptoms are the most common presenting complaints of the GAD patients and the source of significant morbidity. DSM 5 has retained the nomenclature, as GAD although there was a recommendation to name it as generalized worry disorder that would have undermined the importance of somatic symptoms. The literature on functional somatic symptoms in major depressive disorder, somatoform disorders suggest a correlation of the symptoms with constructs such as somatosensory amplification, health anxiety (hypochondriasis), and alexithymia.,,, As functional somatic symptoms are one of the essential criteria of GAD, it is very much relevant from the etiological and psychotherapeutic point of views to measure these constructs in subjects with GAD. In our literature search, we could come across very little research on this important area of investigation., In addition, patients from the South Asian countries are shown to present more often with somatic symptoms than psychological symptoms., However, the research on functional somatic symptoms in general and GAD in particular in South Asian countries is very scant, and none of the studies have evaluated the above-mentioned correlates in patients with GAD., The purpose of the current study was to study somatosensory amplification, health anxiety (hypochondriasis), and alexithymia, in patients with GAD to find their correlation with the severity of GAD. This study was carried out in the outpatient clinic of a psychiatry department in a multi-specialty tertiary care medical institute in North India. The Ethics Committee of the Institute approved the study, and all the patients were recruited after obtaining proper written informed consent. A cross-sectional design was employed. The study included patients diagnosed with GAD as per DSM IV (as per the Mini-International Neuropsychiatric Interview [MINI]), aged between 18 and 60 years, of either gender, educated up to at least Class 5th or with proficiency in reading either English or Hindi. Patient's with comorbid psychiatric disorders (including substance use disorder), the presence of physical illness which could explain the anxiety disorder, organic brain syndromes, and chronic, debilitating physical illness like, diabetes, hypertension, end-stage organ failure were excluded from the study. Patients clinically diagnosed with GAD by two independent qualified psychiatrists were approached for the study. They were explained about the nature of the study and patients willing to participate and provide informed consent were recruited. MINI was used to confirm the diagnosis of GAD and to rule out the presence of other comorbid psychiatric disorders. The severity of GAD was assessed with GAD-7 scale. Thereafter, these patients were assessed on 10 items somatosensory amplification scale (SSAS) and the Whiteley index (WI) for hypochondriasis., The participants completed the 20-item Toronto alexithymia Scale Hindi version (TAS-H). It is a 7-item anxiety scale with good reliability as well as criterion, construct, factorial, and procedural validity. Cut-off points of 5, 10, and 15 are interpreted as representing mild, moderate, and severe levels of anxiety on the GAD-7. Increasing scores on the scale are strongly associated with multiple domains of functional impairment. There is good agreement between self-report and interviewer-administered versions of the scale. SSAS is a self-report questionnaire about the respondent's sensitivity to a range of normal bodily sensations and to neutral and noxious stimuli. These items are scored on a five-point scale from 1 to 5 with higher scores indicating greater somatosensory amplification. Test-retest reliability of this scale is 0.79 (P = 0.0001) and the internal consistency is 0.82 (Cronbach's alpha). In this study, the clinician administered the scale to the participants. WI is a 14-item questionnaire developed by Pilowsky that focuses on health anxiety (hypochondriacal) attitudes and beliefs. A total score of ≥7 has been considered the cut-off for health anxiety disorder or hypochondriasis. Data from psychometric evaluations suggest that the questionnaire has good internal consistency and stability with test-retest reliability of 0.81 (P< 0.001). It is a 20-item self-assessing instrument with response rated on a scale from 1 to 5 and the total score ranges from 20 to 100. It is composed of three subscales a follows: difficulty in identifying feelings and distinguishing them from bodily sensations (TAS-1), difficulty in describing the feeling to others (TAS-2), externally oriented thinking (TAS-3). The score >60 is taken as an indicator of alexithymia. It has a Cronbach's alpha score of 0.89. The TAS-Hindi version (TAS-20-H), translated from the original scale and that has adequate internal consistency and good test-retest reliability, was used in this study. In this study, the participants completed the Hindi version of TAS-20. The statistical analysis was carried out using SPSS 14.0 for windows (SPSS for Windows, Version 14.0. Chicago, SPSS Inc.). Descriptive analysis was carried out using mean and standard deviation with a range for continuous variables such as sociodemographic variables, SSAS scores, 20-item TAS scores and WI. Descriptive analysis was computed as frequency and percentages for discontinuous sociodemographic and clinical variables. For the inferential analysis, correlation analysis was done. Pearson's product moment correlation analysis was performed between parametric variables, and Spearman's rank order correlation analysis was used to study the relationship of nonparametric variables with parametric and nonparametric variables. We approached 89 patients for this study out of which 28 patients were excluded because of psychiatric and physical comorbidity. Sixteen patients initially diagnosed to have GAD by clinicians received a different diagnosis on screening with MINI. Among the 45 eligible patients, five did not give consent to participate in the study and 40 patients were included for this study. The sociodemographic details are summarized in [Table 1]. 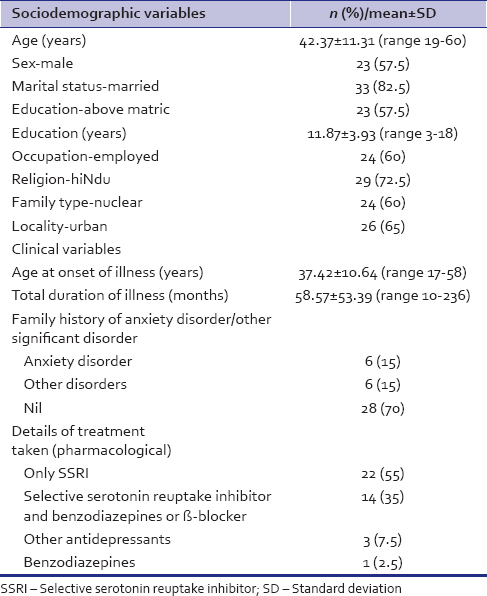 As shown in [Table 1], mean age of onset of GAD was 37.42 (SD-10.6; range 17–58) years and the mean duration of illness at the time of assessment was 58.6 (SD-53.4; range 10–236) months, suggesting that the patients had been ill for a reasonable period at the time of assessment. The results of the GAD-7 scale, SSAS, WI and TAS-H-20 are depicted in [Table 2]. Majority of the patients (90%) scored more than 10 on GAD-7 scale, and more than half of the patients (55%) had a moderate level of anxiety. Half of the patients with GAD had WI score of >7 suggesting the presence of significant health anxiety (hypochondriasis). More than two-fifth (42.5%) of subjects with GAD scored above the cut-off mark for alexithymia. As shown in [Table 3], age of the patient and age of onset for GAD correlated negatively with total SSAS scores, total WI score, total TAS-20 score, and total GAD-7 score. It suggests that patients who are younger and/or have earlier age of onset of illness had higher scores on these psychological correlates. The severity of GAD, as measured with GAD-7 scale correlated positively with SSAS, WI, and TAS-H-20 total scores, suggesting that the individuals with higher severity of GAD had greater scores on these constructs [Table 4]. No other demographic and clinical variable correlated with GAD-7 total score and total scores of various psychological constructs. The mean score of the GAD-7 scale of the sample in the present study is similar to that reported in other studies. Younger patients had higher GAD-7 total score, and this suggests that GAD is more severe in younger patients and as the age progresses the illness becomes less severe. However, it is important to note that it is also quite possible that the older patients were on treatment for longer duration and hence had less severe anxiety, as negative correlation was seen between the duration of treatment and severity of illness as assessed on GAD-7. On correlation analysis, GAD total score had a positive correlation with SSAS, WI, and TAS-H-20 total scores and the scores of these psychological constructs had a negative correlation with age of the patient and age of onset of GAD. The negative correlation seen between the age of onset and age of the patient may be an indirect consequence of the higher severity of illness in younger patients with GAD. Somatosensory amplification refers to the tendency of experiencing somatic and visceral sensations as unusually intense, noxious, and disturbing. Although originally intended to account for the symptom reporting of hypochondriacal patients, the amplification of benign bodily sensations has also been related to more general processes of functional somatic complaints reporting and health appraisal. The mean score on SSAS in this study (25.70) is comparable to that reported for patients with panic disorder (mean score - 27.6) but higher than earlier studies from our center on patients of depression (mean score - 21.56) and somatoform disorder (mean score - 19.38).,, These comparisons again suggest that GAD is more akin to other anxiety disorders on various psychological constructs and differs from depression and somatoform disorders. Although studies have not evaluated the construct of health anxiety (hypochondriasis) in patients of GAD, the literature suggests that there are high correlations between health anxiety (hypochondriacal) symptoms with both anxiety and depressive disorder in general ,, Some authors have observed stronger associations with anxiety, whereas others have reported association with depression. When we compare the findings of health anxiety (hypochondriacal) worry in the present study with the previous studies from our center involving patients of depression and somatoform disorders, the scores of GAD patients were lower compared to that found for patients of depression and somatoform disorders. Hence, it can be concluded that health anxiety (hypochondriacal) worry has a stronger association with depression and somatoform disorder than GAD. In the present study, 42.5% of GAD patients had alexithymia as defined by TAS scores of >60. In one of the earlier studies from Italy, the prevalence of alexithymia in patients with GAD was reported to be 44.3%, which is very much similar to the findings in the present study., When we compare the findings of our study with the study from Italy the mean scores of TAS-20, TAS - III are higher in our study and TAS-I, TAS-II mean scores appear similar. The higher scores in TAS-III may be related to the cultural factors related to externally oriented thinking. There are some studies which have evaluated alexithymia in patients of anxiety disorders and have reported that 34%–66.7% of patients with panic disorder, 28.3%–58% of patients with social phobia, and 12.5% of patients with simple phobia and 12.9%–35.7% of patients with obsessive-compulsive disorder patients to have alexithymia.,,, In previous studies from our center 86% of patients with the first-episode depression and 51% of patients with the somatoform disorder were found to have alexithymia., Given the above findings it can be concluded that the rate of alexithymia in GAD patients is similar to that reported for other anxiety disorders but less than that reported for patients of depression. The following limitations must be kept in mind while interpreting the results of this study. This study lacked the healthy control group and had a small sample size. The sample consisted of 40 consecutive outpatients attending a general hospital psychiatric unit. Although in the literature the incidence of GAD is higher in females, in our study males outnumbered females. Results of this study, therefore, be cannot be generalized to other patient populations. Findings of this study may not apply to children and elderly with GAD, as this study was limited to the adult population. Currently, the cognitive behavior therapy (CBT) models of GAD focus on addressing the meta-worry, worry, and intolerance of uncertainty. The rationale for this being addressing the cognitive aspects would also help in decreasing functional somatic symptoms as well. However, the patients with GAD are shown to be having higher sensitivity for learning from negative feedback. The presence of significant somatosensory amplification, health anxiety, and alexithymia may be the factors why individuals with GAD have higher sensitivity for learning from negative feedback that leads to excessive worry in more than one spheres of life. The development of specific psychotherapeutic interventions to address somatosensory amplification, health anxiety, and alexithymia may supplement, if not replace, the worry based CBTs and lead for better response rates of psychotherapeutic interventions in GAD. Future studies should study the relationship of GAD and psychological correlates in a much larger sample size derived from the general population across different age groups to improve the understanding between GAD and various psychological factors. There is also a need to develop effective interventions focused on the identified psychological factors in GAD to improve the outcome. Kessler RC, Wang PS. The descriptive epidemiology of commonly occurring mental disorders in the United States. Annu Rev Public Health 2008;29:115-29. Gilbody S, Bagnall AM, Duggan L, Tuunainen A. WITHDRAWN: Risperidone versus other atypical antipsychotic medication for schizophrenia. Cochrane Database Syst Rev 2016;9:CD002306. Nagalski A, Kozinski K, Wisniewska MB. Metabolic pathways in the periphery and brain: Contribution to mental disorders? Int J Biochem Cell Biol 2016;80:19-30. Richard EA, Khlestova E, Nanu R, Lisman JE. Potential synergistic action of 19 schizophrenia risk genes in the thalamus. Schizophr Res 2017;180:64-9. Silveira MM, Arnold JC, Laviolette SR, Hillard CJ, Celorrio M, Aymerich MS, et al. Seeing through the smoke: Human and animal studies of cannabis use and endocannabinoid signalling in corticolimbic networks. Neurosci Biobehav Rev 2017;76:380-95. Wittchen HU, Kessler RC, Beesdo K, Krause P, Höfler M, Hoyer J, et al. Generalized anxiety and depression in primary care: Prevalence, recognition, and management. J Clin Psychiatry 2002;63 Suppl 8:24-34. Andrews G, Hobbs MJ, Borkovec TD, Beesdo K, Craske MG, Heimberg RG, et al. Generalized worry disorder: A review of DSM-IV generalized anxiety disorder and options for DSM-V. Depress Anxiety 2010;27:134-47. Sayar K, Kirmayer LJ, Taillefer SS. Predictors of somatic symptoms in depressive disorder. Gen Hosp Psychiatry 2003;25:108-14. De Gucht V, Heiser W. Alexithymia and somatisation: Quantitative review of the literature. J Psychosom Res 2003;54:425-34. Leibbrand R, Hiller W, Fichter MM. Hypochondriasis and somatization: Two distinct aspects of somatoform disorders? J Clin Psychol 2000;56:63-72. Nakao M, Barsky AJ. Clinical application of somatosensory amplification in psychosomatic medicine. Biopsychosoc Med 2007;1:17. Mennin DS, Heimberg RG, Turk CL, Fresco DM. Preliminary evidence for an emotion dysregulation model of generalized anxiety disorder. Behav Res Ther 2005;43:1281-310. De Berardis D, Serroni N, Campanella D, Marini S, Rapini G, Valchera A, et al. Alexithymia, suicide ideation, C-reactive protein, and serum lipid levels among outpatients with generalized anxiety disorder. Arch Suicide Res 2017;21:100-12. Kirmayer LJ, Young A. Culture and somatization: Clinical, epidemiological, and ethnographic perspectives. Psychosom Med 1998;60:420-30. Hoge EA, Tamrakar SM, Christian KM, Mahara N, Nepal MK, Pollack MH, et al. Cross-cultural differences in somatic presentation in patients with generalized anxiety disorder. J Nerv Ment Dis 2006;194:962-6. Chaturvedi SK, Bhandari S, Rao S. Illness behaviour assessment of psychiatric patients with somatic presentation. Indian J Psychiatry 1988;30:205-8. Sheehan DV, Lecrubier Y, Sheehan KH, Amorim P, Janavs J, Weiller E, et al. The mini-international neuropsychiatric interview (M.I.N.I. ): The development and validation of a structured diagnostic psychiatric interview for DSM-IV and ICD-10. J Clin Psychiatry 1998;59 Suppl 20:22-33. Spitzer RL, Kroenke K, Williams JB, Löwe B. A brief measure for assessing generalized anxiety disorder: The GAD-7. Arch Intern Med 2006;166:1092-7. Barsky AJ, Wyshak G, Klerman GL. The somatosensory amplification scale and its relationship to hypochondriasis. J Psychiatr Res 1990;24:323-34. Pilowsky I. Dimensions of hypochondriasis. Br J Psychiatry 1967;113:89-93. Speckens AE, Spinhoven P, Sloekers PP, Bolk JH, van Hemert AM. A validation study of the whitely index, the illness attitude scales, and the somatosensory amplification scale in general medical and general practice patients. J Psychosom Res 1996;40:95-104. Ruiz MA, Zamorano E, García-Campayo J, Pardo A, Freire O, Rejas J. Validity of the GAD-7 scale as an outcome measure of disability in patients with generalized anxiety disorders in primary care. J Affect Disord 2011;128:277-86. Barsky AJ, Goodson JD, Lane RS, Cleary PD. The amplification of somatic symptoms. Psychosom Med 1988;50:510-9. Chakraborty K, Avasthi A, Kumar S, Grover S. Psychological and clinical correlates of functional somatic complaints in depression. Int J Soc Psychiatry 2012;58:87-95. Grover S, Aneja J, Sharma A, Malhotra R, Varma S, Basu D, et al. Do the various categories of somatoform disorders differ from each other in symptom profile and psychological correlates. Int J Soc Psychiatry 2015;61:148-56. De Berardis D, Campanella D, Gambi F, La Rovere R, Sepede G, Core L, et al. Alexithymia, fear of bodily sensations, and somatosensory amplification in young outpatients with panic disorder. Psychosomatics 2007;48:239-46. Kreitman N, Sainsbury P, Pearce K, Costain WR. Hypochondriasis and depression in out-patients at a general hospital. Br J Psychiatry 1965;111:607-15. Timsit M, Dugardin JC, Adam A, Sabatier J. What is meant by a diagnosis of hypochondriacal neurosis? Acta Psychiatr Belg 1973;73:458-83. Baker B, Merskey H. Classification and associations of hyprochondriasis in patients from a psychiatric hospital. Can J Psychiatry 1983;28:629-34. Kellner R, Abbott P, Winslow WW, Pathak D. Anxiety, depression, and somatization in DSM-III hypochondriasis. Psychosomatics 1989;30:57-64. Zeitlin SB, McNally RJ. Alexithymia and anxiety sensitivity in panic disorder and obsessive-compulsive disorder. Am J Psychiatry 1993;150:658-60. Fukunishi I, Kikuchi M, Wogan J, Takubo M. Secondary alexithymia as a state reaction in panic disorder and social phobia. Compr Psychiatry 1997;38:166-70. Parker JD, Taylor GJ, Bagby RM, Acklin MW. Alexithymia in panic disorder and simple phobia: A comparative study. Am J Psychiatry 1993;150:1105-7. Heiden Cv. Metacognitions in generalized anxiety disorder: Theoretical and practical perspectives. Expert Rev Neurother 2013;13:135-41. Khdour HY, Abushalbaq OM, Mughrabi IT, Imam AF, Gluck MA, Herzallah MM, et al. Generalized anxiety disorder and social anxiety disorder, but not panic anxiety disorder, are associated with higher sensitivity to learning from negative feedback: Behavioral and computational investigation. Front Integr Neurosci 2016;10:20.